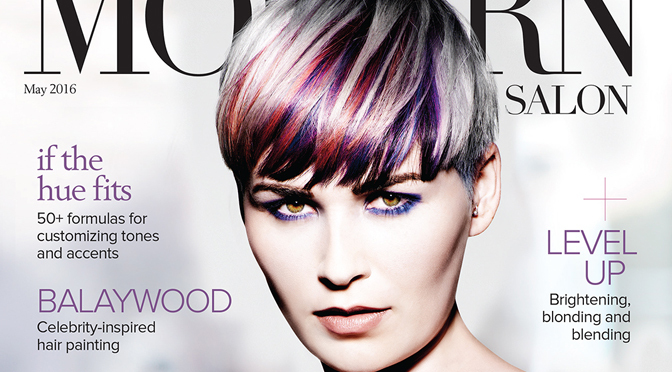 Drawing inspiration from the decade best known for contrasting colors, geometric designs and angular shapes, Paul Mitchell® Global Editorial Director Lucie Doughty makes a graphic statement in the cover story of Modern Salon magazine. Asymmetrical hair accented by bold colors was all the rage in the 1980s. Worn today, the style has a unique effect that is part punk, part polished. After applying black to a section of the hairline, Lucie creates vibrant ribbons along the fringe and finishes the center back of hair with a lustrous veil of color. Alternating applications of pink, blue, tomato, yellow and teal complement hair’s swingy shape – courtesy of Paul Mitchell® International Trainer Julian Perlingiero.